For the past few years, Mike Trout has been the biggest steal in sports. He's had two otherworldly seasons, and he's only 22. So on the surface, news that the Angels are trying to lock him up to a six-year deal worth about $150 million makes sense. But it's actually remarkable for how much sense it makes. In brief, for the uninitiated, Trout has accrued just two years and change of service time in the majors, meaning that he has another four years to go until he can become a free agent. After this season, Trout would be up for arbitration. As a general rule, the three arbitration years come in at 40, 60, and 80 percent of market value, with superstars faring a bit worse. Then, if a player signs an extension beyond those years, they'll "sell" some of their free agent years at market value. But for Trout, who's made just $992,500 the past two years combined, the problem all along has been determining what that market value actually is. The price for one WAR has basically been set at $6 million per season, which, as we've seen with Robinson Cano, can lead to very large numbers if a player projects well. The thing is, projections for next season have Trout down for anywhere from 8.2 to 9.7 WAR, which if you're scoring at home, is between $49.2 and 58.2 million in market value. Dan Szymborski has him down for 9.5 WAR next year, and a total of 76.1 over the next 10 years. If you apply modest 5% annual inflation to the cost of a win, he projects to be worth around $560 million over the next decade, with $400 million of that coming after he'll be eligible for free agency. Obviously, Mike Trout is not going to be paid half a billion dollars, but it looks like he's going to get closer than anyone thought. According to Yahoo, that $140-150 million deal the Angels are working on is close to being finished. (The sides are, comically, "only" differing in the "low eight figures.") 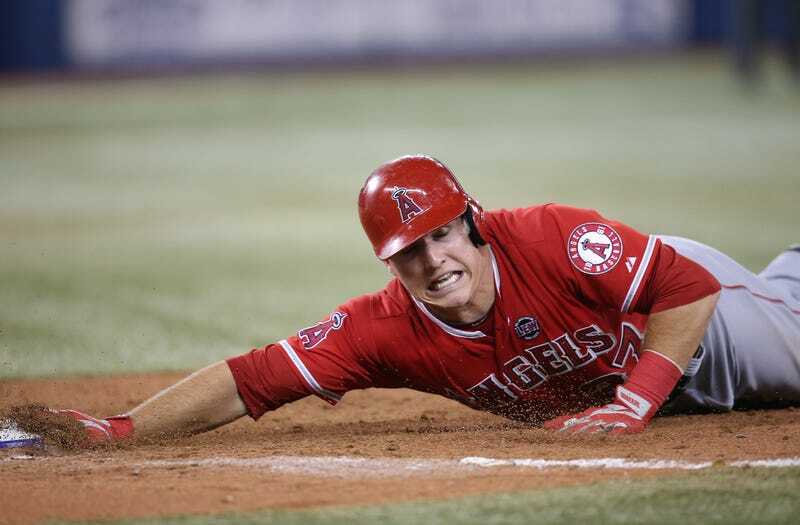 A basic structure would value the final two years of the deal, when Trout was 27 and 28, at $35 and $38 million. A-Rod was the highest paid player in the majors this past year, at a $30 million salary. Szymborski projects Trout at 7.5 and 7.2 WAR for 2018 and 2019, and a pocket calculator will tell you that that places a fair salary range at well over $50 million per year for those seasons, which is, of course, absurd. But so is Mike Trout. Take those projections above: they'd put Trout 13th all time in WAR from age 22 to 31, doing just in those years what players as great as Ozzie Smith and Frank Thomas did over their entire careers. The remarkable thing is, if Trout signs the six-year deal, he'll be up for free agency again at age 28, which, like A-Rod, is on the crazy young side of things. The shortish deal (many had predicted an eight- or 10- or even 12-year deal) gets Trout back on the market quickly and able to take a shot at becoming baseball's first $50 million (or at least $40 million) man, but also cossets the Angels from the faint possibility that Trout bucks projections and becomes a merely great player, instead of the celestial body that's been patrolling center at Angel Stadium. The fact that Mike Trout is in a place where, having barely reached drinking age, he can command a contract that will eventually pay him $38 million per year speaks to the extraordinary flexibility of baseball's economy, which unlike other major American sports, can and will pay its greatest players something like what they're worth. That he could still be a bargain at the price speaks to just how exceptional he is.